Summary This article describes the differences between offline and online Analysis portfolios. Starting with askiavista 5.3.2.0, you can import portfolios created by askiaanalyse. Because askiavista was originally built primarily to target users who do not, necessarily, have analysis skills, it didn't integrate the full features of the offline Analyse product which is specially built for the expert users. 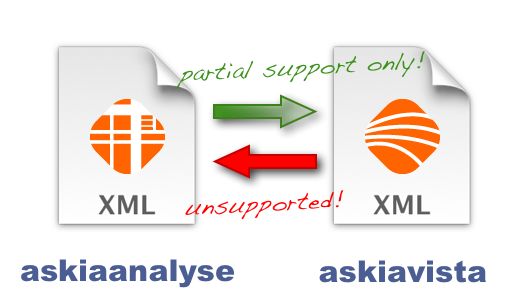 So currently, though we have worked to provide a way to import askiaanalyse portfolios into askiavista, this import has limitations. We strongly recommend you check the following, non-exhaustive, list of incompatibilities before importing portfolios. As a rule of thumb, one could say that in most cases, comparing both applications' interfaces can provide a quick indication as to whether a feature is supported on both sides. Last, we can already inform concerned users that surveys with multiple Categories in askiavista, as well as files with duplicate ShortCuts will very likely be prone to cause trouble. 1 Such as: Number formatting, display as stats. 4 When a weight is applied. 5 However it remains available for arithmetic or conditional formatting. 6 Valid for all options, except those missing, ie. compare the interface between askiaanalyse & askiavista for more details.